Take her out to the ballgame or the classroom with this oh-so-soft baseball raglan tee, available in crowd-pleasing colors and styles. 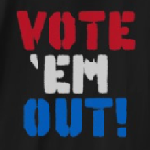 Vote 'Em Out! election, politics.